Bright and sunny again today. Over night low was 51F and the high today was 76F. Wind was light from West at 4mph. Put the coffee on and took Joy for a walk. Jerry and Lupita were leaving this morning. I planned to go down to say good bye, but when I looked they had already left. Helped Alan check the roof caulking and Jeep rear window wiper blade. Showed him the pump I use to fill with water. At noon we went in to the Foothills to do laundry. 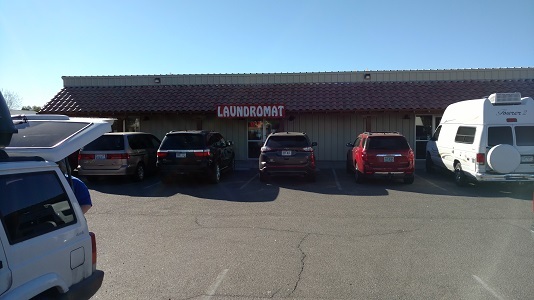 We went to the Payson Drive Laundramat. They have an attendant and large machines. They also have WiFi. Took about 2 hours. Stopped at the Pacific Walmart for root beer, got the last 12 pack. Got Cathy a cone and myself a McDouble and small fry at the McDonalds in the store. Took the one lane bridge and turned at the Paradise Casino by the Quechan Housing Authority houses. Ended up out in the middle of fields. Finally got back to the highway and stopped at the post office in Bard for the last time. Went down for the camp fire. Jim and Lucy will be leaving in the morning. Lucy made Bloody Marys.